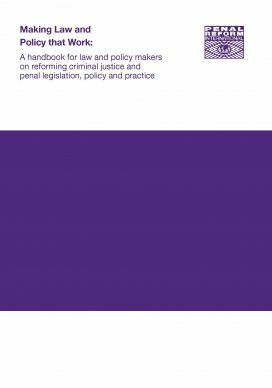 Making Law and Policy that Work is aimed at specialists and non-specialists faced with the responsibility of creating a policy and legislative framework for criminal justice and penal systems. It recognises that criminal justice reform requires expertise and experience in a variety of disciplines which are rarely embodied in one person. It takes into account the fact that many countries in transition lack specialists. It aims to provide clear guidance and practical suggestions for reform in line with an international human rights framework which can be applied in different contexts and countries. Making Law and Policy that Work is intended to be a living publication that reflects the latest developments and thinking on criminal justice reform. We therefore welcome your comments, corrections and contributions, particularly examples of good practice in policy, legislation and implementation. To read online, please click on the attachments below. NB The French, Spanish versions are only in electronic format.